The Van Gogh Museum teamed up with highly-acclaimed LOQI to bring you a fusion between art and fashion. 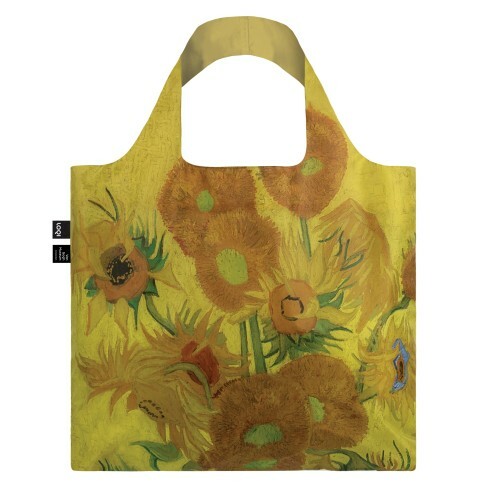 This fabulous tote bag printed in the vibrant colours of Van Gogh's Sunflowers can be carried wherever you go. The lightweight material can be folded into a small pouch of 11 x 11.5 cm, which will easily fit in your handbag. The bag has a delicate line drawing on the backside. With a handle of 27 cm, this versatile bag can be worn as shoulderbag or shopper. Water resistant | Carries up to 20 kg | Small pocket on inside | Foldable to zippocket of 11 x 11.5 cm.